Technically Advanced Balms. For Comfort. For Life. 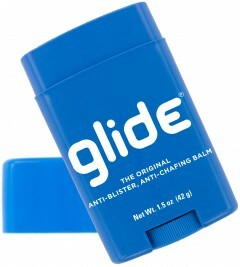 BODYGLIDE® Anti-Chafe balm is the recognized leader for comfort. It helps prevent and relieve hot spots on feet, and chafed, chapped and cracked skin from head to toe; good during & after activity. It penetrates the skin and creates an invisible, comfortable barrier against friction and moisture – without clogging pores or trapping perspiration; feels ‘dry’ to the touch. Protect Against - Hot spots on feet and rubbing that causes saddle sores, chafed, chapped, and cracked skin, irritation from bras, even irritation from skin rubbing skin; used with footwear, orthotics, clothing, sports and swimwear, braces, gear, prosthesis, compression wear, wetsuits.